In Dec's issue of Young Parents.. Interviewer/writer : Jean… - A mummy's inane blabberings.. 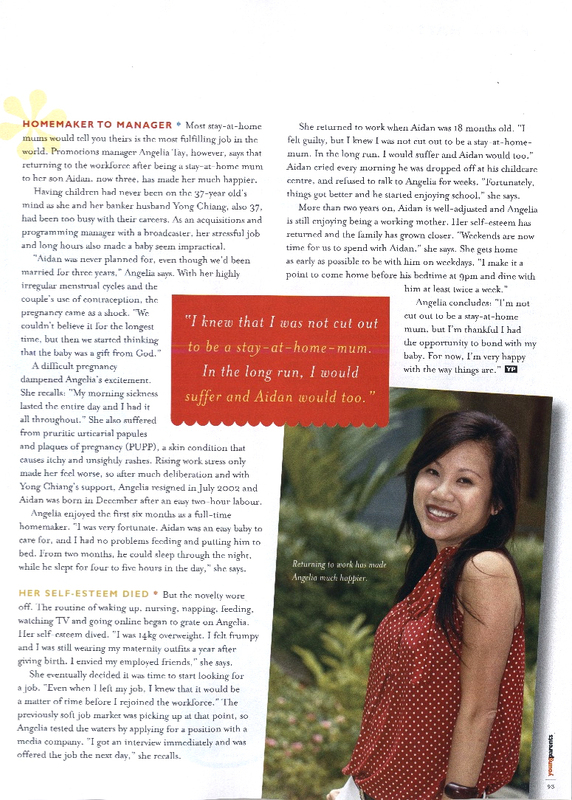 In Dec's issue of Young Parents..
My colleague said I looked pregnant in the pic *sob* Another colleague commented that my blog pictures look better. Of coz lah..all my blog pics are photoshopped. Jean's a fab writer. The feature was on mid-career change. After the article was written, the editor wanted to change the angle of the story to "Stepping Up in their careers". I was very uncomfortable with the proposed switch because I don't consider 'sahm to wohm' a step up and didn't want to give the impression that I thought so. Jean shared my views and managed to convince the editor to stick to the original angle. Side track abit. 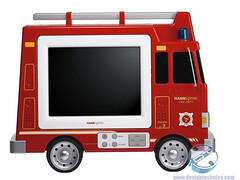 Found this cute TV at Funan, perhaps u could consider this for Aidan Birthday present ! So nice. yeah ive seen it! I thought it was really cute but v ex though..did u buy it for ur kids? You still look gorgeous thiugh I must say they could have taken a better shot!! where got preggie looking??? CHEY! Re: where got preggie looking??? CHEY! no lah. dun look pregnant! hee. hm.. really cant imagine how aidan refusing to speak to you. you must had felt really upset at that time right? i was quite hurt but i understood why he was behaving that well. i guess he felt that i was abandoning him..
Was that photo meant to make you look more mummy-like? :P I bet that top would look a lot funkier from another angle, and less 'maternity'! heh i dont think so. it was taken at my office actually. i think it's because my blouse was the billowy sort and the photograph was taken outdoors when it was rather windy..
i think you look fine! it's just the angle? the article made me know you better. and i now understand better why having aidan is good enough too. What are you talking about? You still look like a HOT MOMMA! you look nice in the picture...:) great article to boot! btw i saw you in the office canteen today. :) breakie. angie, it's the angle the photo is taken lah. u look happy and great, ok.
i think you look fine lah! still very chio. You look fine lah! Slim enough to carry a top like that off! For me, I think I will look like a strawberry. come to think of it, i do look like a strawberry..no wonder aidan likes me in this top :D..
You look great lah... see arms not fat, face not fat... can tell it was the wind darling.